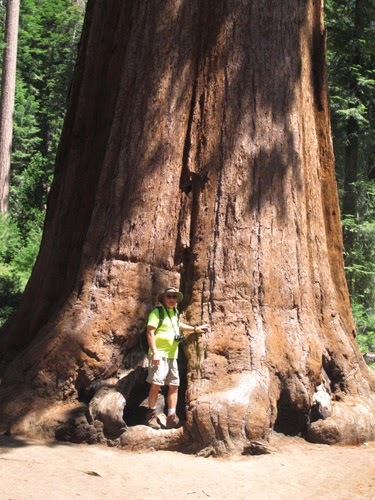 Just the base of this sequoia dwarfs Larry. Until you stand beside (or inside) a giant sequoia, it’s hard to imagine the enormity of these trees. In terms of sheer volume, they are the largest living things known to humans. 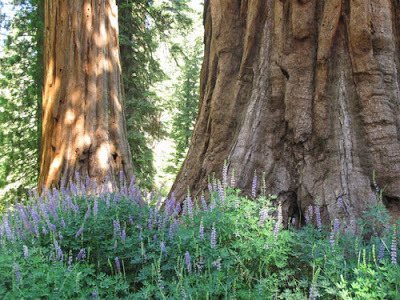 It’s these masterpieces of nature that we’ve come to admire in the Mariposa Grove of GiantSequoias. Located in the southeastern part of Yosemite National Park, the grove contains more than 500 mature trees, some estimated at 3,000 years old, up to 378 feet high, and more than 300 feet in diameter—quite an awesome sight! We arrive at Mariposa in time to take the first tram tour at 9:30 a.m. ($26.50 for adults). With our earphones and radio sets, we hear commentary while riding in the open air tram and learn that the creation of Yosemite as a national park was instigated after Mariposa Grove was first designated as a protected state reserve. The tram takes visitors past the Fallen Monarch, a massive sequoia with spread out roots, suspected to have fallen centuries ago. The Grizzly Giant of one of the largest (and most gnarly) trees in the grove and is estimated to be 1800 years old. Looking up we see a huge limb that is almost seven feet in diameter—larger than the trunks of many other tree species. California Tunnel Tree is still alive and growing. 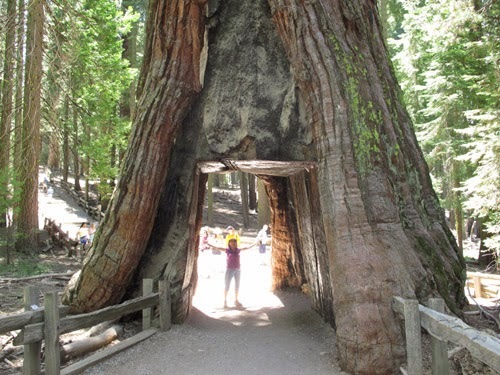 Just beyond the Grizzly Giant is the California Tunnel Tree, cut in 1895 to allow horse-drawn stages to pass through; today visitors can stroll through its mid-section and take photos from inside a tree. You may have seen pictures of cars driving through the famous Wawona Tunnel Tree. Visitors were actually able to drive through it from 1881 when the tunnel was cut until 1969 when the tree collapsed under a heavy snow fall. Another anomaly is the Faithful Couple, two large trees that have fused together at their bases but remain separated higher up. Faithful Couple is perhaps the largest, although we see the formation several times as we ride, and later walk, through the grove. Wildflowers decorate the ground beside the trees. 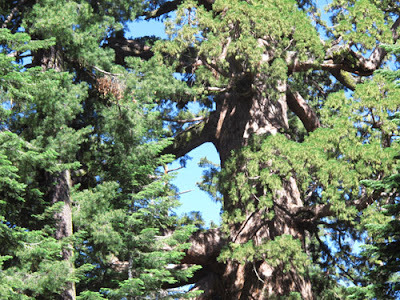 We ride the tram to the Mariposa Grove Museum, a cabin that contains exhibits on the ecology and history of giant sequoias. At that point we leave the tram to walk two miles on the Outer Loop Trail back to the starting place. Beautiful purple and yellow wildflowers fill open spaces surrounding the trees. Other notable trees to see include the Bachelor and Three Graces, four trees that share root systems (if one falls, all will) and the Clothespin Tree, which features a natural tunnel wider than a car created by repeated fires. 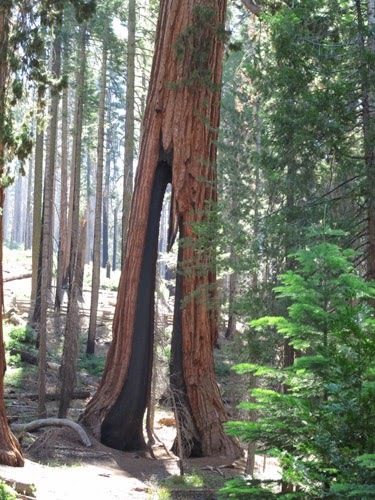 Fire doesn’t destroy sequoias, but you often see a black triangle on the trunk indicating damage. However, as long as the outer bark is okay the tree will survive. The sequoias’ resistance to fire, disease, insects, and decay has allowed them to endure for many centuries. Thanks to Galen Clark, the naturalist who initially drew attention to and urged protection of these trees, Mariposa Grove was incorporated into Yosemite National Park in 1906. It’s truly one of the most magnificent forests anywhere.